← Jitters Coffee ~ Local Coffee On The Go In Cary! Holiday weekends are usually a little slower in the Triangle event wise, but you can still find some fun things to check out this weekend. This weekend there are some great live music performances to check out. Here my top picks for things to do this Memorial Day Weekend. Enjoy! If you are looking for some great live music, you don’t need to look any further than Sola Coffee in North Raleigh. They typically have live local music each Friday and Saturday night starting at 7:30pm. This Friday Sola is host to Chris Titchner (Acoustic Guitar & lyric-driven tunes). Join Sip…a wine store for their 2nd annual Wine, Beer and Music Festival. Each Festival event highlights a winery or wine region, a brewery, a local musician or band, and an event inspired special. This year’s Festivals promise to be even bigger and better with added events and the Huble Pig Food Truck. Music/Beer/Wine. Tickets are $5. Children, DDs are free. Wine and beer sold separately. If you like birds this event is for you. The pet bird fair at the NC State fairgrounds this weekend will feature a large bird display area, birds from around the world , raffle, food & drink, and a large Selection of vendors. 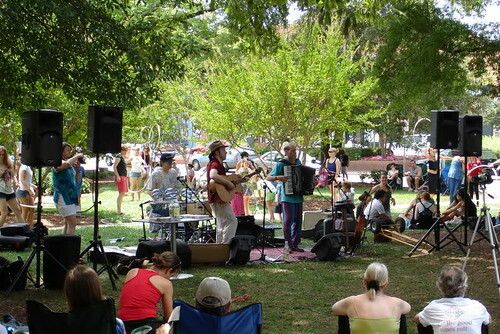 Each Sunday during the summer you can enjoy a fun Sunday morning sitting in the shade taking in some free tunes at the Weaver Street Market in Carrboro. Free music every Sunday from 11-1. This weeks featured musicians are Dana & Susan Robinson. Bring a blanket or chairs and relax. Bring the kids, friends, a picnic, and a blanket! Town of Wake Forest, the Six Sundays in Spring concert series returns for 2013 on consecutive Sundays from April 28 through June 2. This week’s headlining musician is Ghezzi. These FREE concerts are held at E. Carroll Joyner Park Amphitheater. Opening bands starting at 3 pm, with the main acts starting at 5 pm and ending at 7 pm. Food vendors will there include VFW food trailer, the Lemon Tree, Sweet Traditions by LeAne (cupcakes) and Lumpy’s Ice Cream!